We really liked the original Gravity Rush (Gravity Daze in Japan) here at T3 Towers thanks to its unique and fun take on a world with shiftable gravity. It became one of the PS Vita’s most playable and well-received titles, with the new IP offering a unique aesthetic and novel gameplay mechanics. It wasn’t perfect, but it was highly enjoyable, so much so that it later got a remastered port to the PS4. Fast forward to 2017 and we’ve been playing an advanced press copy of Gravity Rush 2, which is released on Jan 18 as a PlayStation 4 exclusive. Here are 10 reasons why we think it's worth your time. First up, we were pleased to see that the original game’s stylish cell-shaded graphics have made a return, however this time they’ve been improved dramatically. Textures are more detailed and higher res, particle effects - especially when gravity shifting is taking effect - increased and given more pop and lighting effects made more realistic. 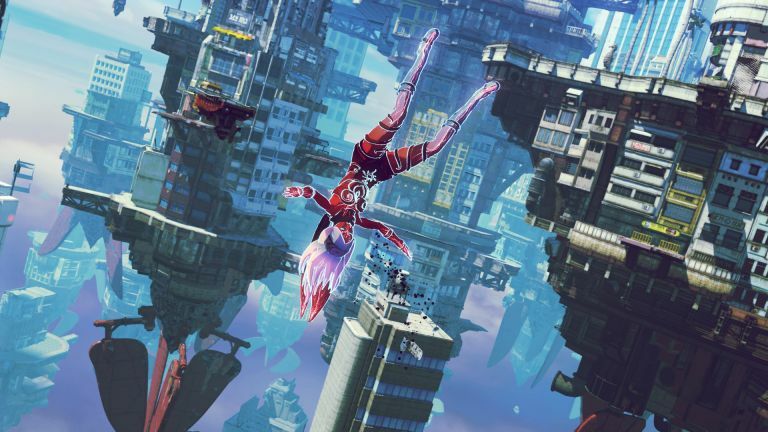 The result of all this tinkering is that Gravity Rush 2 looks stunning. Kat, the heroine of Gravity Rush makes a triumphant return in Gravity Rush 2, along with a host of other returning characters. Got used to fellow gravity shifter Raven, or affable police officer Syd? Well they’re back and you’ll need their help as a plethora of new Nevi, the game’s Studio Ghibli-style enemies, are standing in your way. The original Gravity Rush was almost entirely based in and around the city of Hekseville. Gravity Rush 2 sees Kat return to Hekseville, however it also introduces a brace of other unique environments too, including the the floating village of Banga and the rich and varied worlds of The Rift Plane. As such, expect to be shifting gravity and exploring far more locations than ever before. One of the defining characteristics of the original Gravity Rush was its visual novel cutscenes, which were used to advance the game’s plot, so we were pleased to see they have returned in the sequel. They’ve been taken to the next level though in terms of art and complexity too, delivering better and more impactful exposition. Japanese composer Kohei Tanaka has gained a really solid reputation producing music for anime, film and video games, with his work appearing in major franchises such as Gundam, Dragon Ball, Pokémon and Sakura Wars. He also delivered the soundtrack to the original Gravity Rush and here, in the sequel, he builds on that beautifully. If you’re all about the bang for your buck then Gravity Rush 2 should appeal - the sequel is far bigger than the original both in in-game world and content. Indeed, the sequel has three times the quantity of missions to take on and a game map that is 2.5 times bigger. A playthrough of the game will take anywhere between 20 to 40 hours. Of course, Gravity Rush 2 wouldn’t be much good if it didn’t nail the series’ core mechanic now would it. Luckily, defying gravity is more insane than ever, with Kat flying through space, dodging incoming projectiles, gravity sliding up structures, dodging mid-air attacks and hurling environmental objects at enemies with consummate ease. Want a magical star cat companion? You got it! Want characters with crazy costumes? You got it! Want quests where you use your godly gravity shifting powers to find cheeky white ducks that have flown their pen and littered themselves noisily round a floating village in the sky? You got it! Not only does Kat have new gravity-shifting powers in Gravity Rush 2, but she's also now the custodian of new gravity styles which allow you to alter your movement and attacks in the world. For example, switch to the Lunar gravity mode and Kat can jump higher, while Jupiter increases the power of attacks. "There are very few cases where an IP born on a portable console gets an official sequel on a home console. This is no mere continuation of the series, but a huge leap forward with everything upgraded and improved. Indeed, I could talk all day about what we've achieved, but I think if you give it a try, the title will speak for itself." Gravity Rush 2 is available on PlayStation 4 from January 18, 2017. For more information about the game then check out its official website.